Warrington Kickboxing Studio welcomes absolute beginners, no matter what level of fitness they are. Our training programs are ideal for fitness, core-stability, flexibilty, improving strength and burning bodyfat as well as improving confidence! 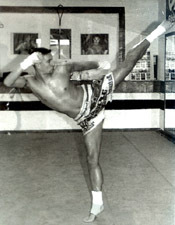 Kickboxing is known as 'The art of Striking', and Striking is regarded by many as the ultimate method of self-defence. Our system teaches striking using Kicks, Punches, Knees, Elbows and Open-Palm techniques. With correct and regular training Kickboxers can develop power in their striking technique that is much stronger than their physical bodyweight, ( known as 'punching above your weight' ) thus leading to a tremendous advantage self-defence situation ever arise. As one of the U.K.'s premier martial arts schools, we offer expert tuition in Kickboxing, the worlds most practical martial arts system 7 days a week with sessions available from 6.00am until 10.00pm. Our Black Belt program is suitable for people of all ages and abilities, male or female, that are looking for realistic training with rapid results. People are not expected to compete at Warrington Kickboxing Studio. The majority of our members train in our Black Belt program and practise Kickboxing primarily for the Fitness and for the Self-Defence applications of the system, and this is the core of our training syllabus. Additionally what makes Warrington Kickboxing Studio stand out from other clubs is the fact that we do not run 'Large Classes' of upto '40' persons or more training at the same time, as is the usual case at most Martial Arts Centres. Large classes have a high student-to-teacher ration, which results in students receiving less direct instruction than they otherwise would in a Small-Group-Class. Overcrowded classes should be avoided by anyone seeking quality martial arts tuition. Warrington Kickboxing specialises in adult 'SMALL GROUP CLASSES' which have a maximum of just '8' people in a lesson and due to this, we are able to fast track our new starters, so that in no time at all they are soon seeing the benefits of their training and are quickly progressing. 'Duels' ( which is just two people and an Instructor ). All our Personal Training sessions are available 7 days a week from early mornings and afternoons through to late evenings, at anytime, to meet your needs. Getting started is very simple, we have adult beginners starting every single day, and you are very welcome to call into the Studio, watch a session and speak to one of our Instructors. Alternatively text "WARRNGTON KICKBOXING" to 07973-43-18-18 and we will send you our starter information. For children, we run classes totally separate to our adults sessions. Junior-School-Kids Classes ( aged 6 - 11 ) and we also have separate High-School-Kids sessions ( aged 11 - 16 ). The majority of our members are working professionals aged between 20 and 55, with almost 50% of our members being ladies, which is incredible a most martial art classes only have a female participation rate of 10%! As stated earlier, most of our members join Warrington Kickboxing Studio to simply to improve their fitness and to lose weight quickly, or for the Self-Defence applications and to increase their Confidence. If any of these are your aims, then our Black Belt program will quickly help you to achieve these goals. Maybe you would like to train specifically for the Belt Gradings, eventually earning your Black Belt. Whatever your personal aims, our highly experienced Black Belt Instructors and Champions are here to cater to your needs as an individual. If expert level Kickboxing tuition at a school that has built a leading reputation over the last 20 years is what you are looking for, then we are the definately the Martial arts School for you! Additionally our high-end training facilities make the Studio one of the best equipped martial art centres in the whole of the country as you will see on the photographs as you browse through our website! 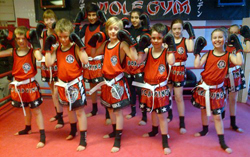 We actually have not just one - but two Studios within Warrington Kickboxing Studio, both purpose designed and built. One is 'Personal Training Studio' and the other is a 'Group Class Studio'. 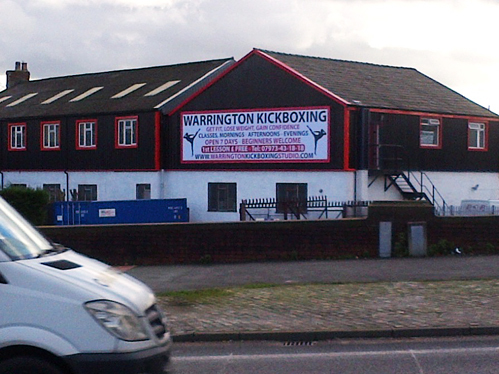 The location of the Warrington Kickboxing Studio, is ideal, located in the actual town centre of Warrington, ( WA4 1AY ), just across the main roundabout at Bridgefoot island from the once famous Mr Smith's Nightclub, with more than ample car parking. BLACK BELT PROGRAM: The majority of our members, especially new members, participate in our very successfull Black Belt program. ( high calorie burn ). There is no Free-Sparring on our Black Belt program, as Free-Sparring is taught on the Champions program. CHAMPIONS PROGRAM: Many of our advanced members, ( Brown belt and above ), should they have an interest in competing, also participate in our Champions program. 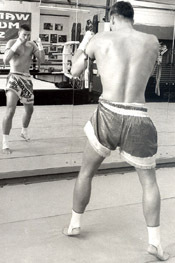 The Champions program teaches Kickboxing as a 'Combat-sport' concentrating on Competition specific striking combinations, various types of stamina drills, high-intensity interval training and Ringcraft which comprises of various types of 'Controlled-Sparring' as well as 'Free-Sparring' ( which is only allowed and can only be taught in the Ring ). Our Champions program has been incredibly successfull over the last 20 years. Producing not one but two European and two World Champions! Something that should be seriously considered when comparing Martial Arts schools, as many have never even produced a single British Champion! Simply text your "WARRINGTON KICKBOXING" to 07973-43-18-18, and Neil will contact you to book a £FREE class! Where we lead, 'other Martial Arts centres' merely try to follow! To be YOUR BEST you need to train with THE BEST! BEWARE OF 'CHEAP' IMITATIONS ( Click here ). Action Photos of Warrington Kickboxing Champions competing under Muaythai Rules & K-1 Rules ( Click here ). 'K-1 MAX England Grandprix 2013' ( Click here ).